Australia's GOAT on a range of topics following AUS-X Open Sydney. 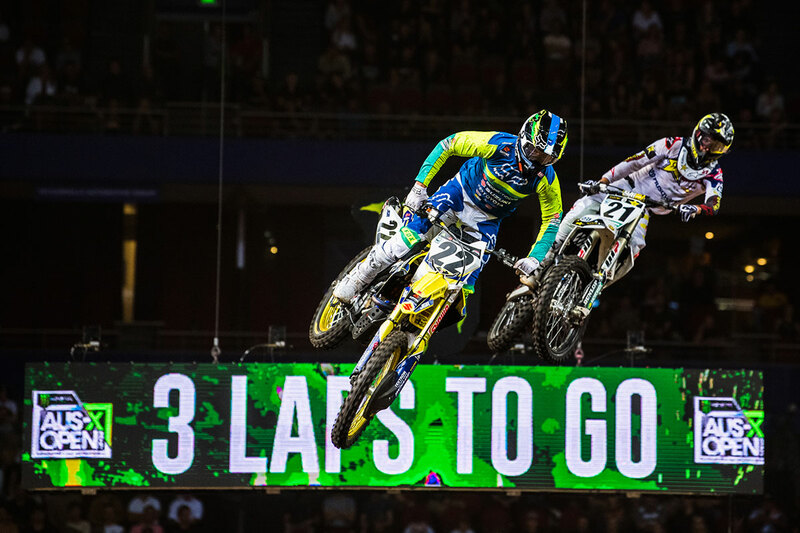 On return home for the annual Monster Energy AUS-X Open Sydney, Australia’s greatest-ever Chad Reed put up a strong fight aboard his JGRMX-prepared RM-Z450 to land fifth overall. With a heat race win and leading Australia to victory over Team USA in the ‘Showdown Relay’, it was an admirable effort from the 36-year-old even though a fall in the first SX1 final and a misunderstanding surrounding the Shannons Shortcut in final three potentially denied him of a better overall result. MotoOnline.com.au tracked down Reed post-race to get his take on a variety of topics from the weekend. We got good mileage here this weekend and every gate-drop is always a good thing even if the end result isn’t always what you expect or what you want. The reality is that you have to remind yourself it is only November and you’re here to put on a show. 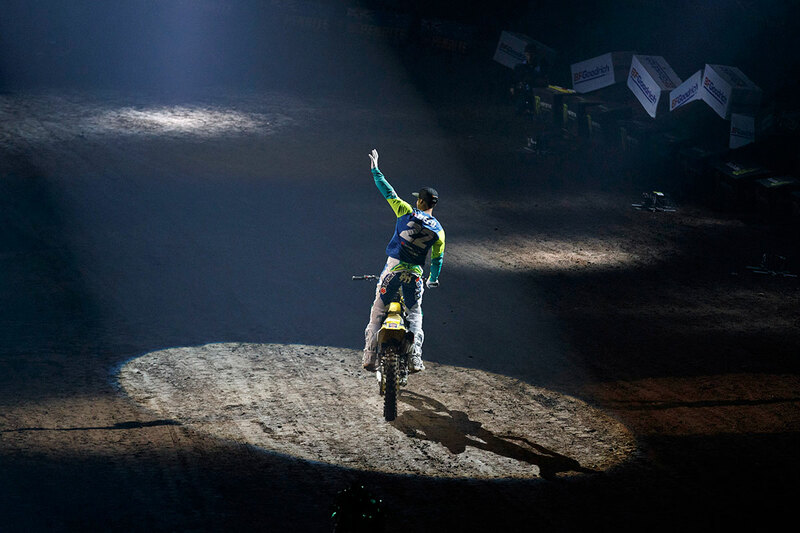 I feel that my show was a little less than what I wanted it to be, but honestly, the electricity, the excitement and the feeling of coming here and performing in front of the home crowd… in some ways it’s a lot of pressure. I take it personal and, for me, I want to give back [to the fans]. You hear the cheers and I seriously feel the love, so in return you want to give them something to cheer about and to be super-stoked on the performance of myself. I don’t really think that I fell short on that, but obviously I want my results to be better. Honestly, in the last race I kind of have to laugh, because what else do I do? I never even knew that you weren’t allowed to take the joker lane more than once and, truthfully, because of my crash in the first one nobody was around me and I didn’t have to take it. Otherwise I would have taken it three times [laughs]! So, you know, I mean it was only two or three weeks ago I did Monster Cup. At that race the whole time you’re thinking ‘don’t forget the joker lane, don’t forget the joker lane’ because typically their joker lane is longer. Here, you self-penalise yourself if you don’t take it, but in the Vegas they obviously penalise you if you don’t take it – I think the same penalty, around five places or something like that. That thought process and whatever, me not hearing or knowing, I wasn’t aware of the rule. A little bit of a rookie move there. Obviously I got to the front because I took the joker lane, which was something I shouldn’t have done, but you know what was funny is that I knew I passed Jason in the joker lane and I was just expecting that he would re-pass me back there. So here I am, with a completely different thought process thinking that Jason was just riding around until he took the joker lane on the final lap or something like that. When he didn’t come by, I didn’t know what happened because we don’t have pit-boards here, so maybe he was doing calculations. He knew the rules, he had the heads up [laughs]. It was sketchy as, that first start in the finals into the first turn… I was backing ‘er in [laughs]! I think my supermoto skills and flat-track days came into play there. I was pushing in there with, I think it was [Justin] Brayton on my inside and I was like, push, push, push, push then suddenly the rear just went. Obviously at that point you pretty much just have to stay in it, stay committed to it and yeah, the big girl got loose. And then I was in third, you know, struggling on certain parts of the track kind of moving around and then, yeah, the crash happened. I felt like a complete goon doing what I did, but then Brayton and something like four other guys in front of me did the same thing, so I didn’t feel so bad [laughs]. I’ve been racing indoors since I was 12 and I don’t know that I’ve ridden a tougher, more slippery and challenging indoor event than tonight, so it was really, really tough. Though my result wasn’t… you know I didn’t come here and win or I didn’t come here and get on the podium, I think that it was really good data for us to take in and learn from. My riding and my fitness, everything felt like where I kinda wanted it to be, so we just need to continue on a little bit feeling in the front-end and we’ll keep working on that.